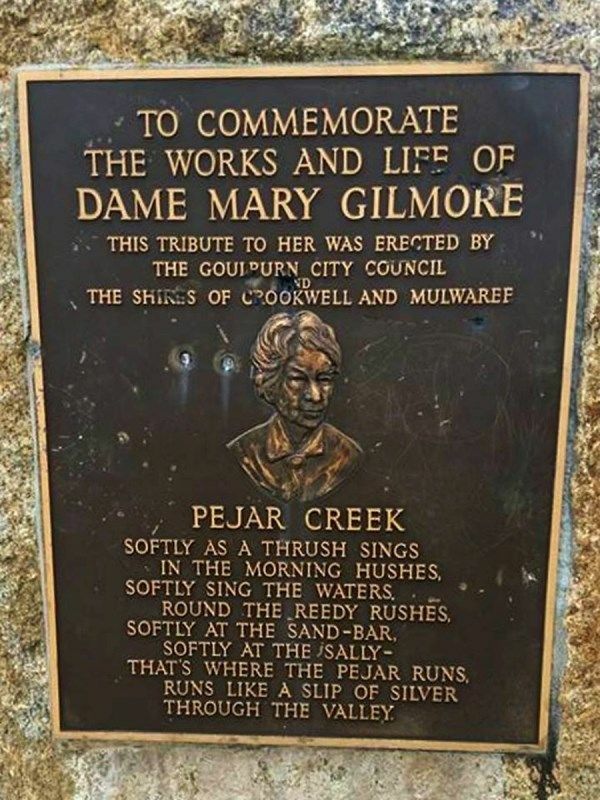 The plaque commemorates the life and works of poet and journalist Dame Mary Gilmore who was born in the area. Dame Mary Gilmore, born Mary Jean Cameron on August 16, 1865, is one of Australia’s best known and most loved poets. From the first publication of her work in 1910 till her death in 1962, her poetry was widely published and much-loved, despite the opinions of critics who felt that much of it was ‘doggerel and propaganda’. So well-known is she that her face appears on the Australian $10 note, along with the text of one of her poems. Gilmore grew up as the daughter of an itinerant worker, a carpenter who moved frequently during the first ten years of her life. Her education was necessarily fragmented due to the frequent moves, and it wasn’t till the family settled permanently in a home built by the poet’s father when she was about ten, that she finally attended a school with any regularity. At age 14, she began working as an assistant in her uncle’s school at Yerong Creek, then accepted a position with the Wagga Wagga Public Schools when she completed her teacher’s examination in 1882 at the age of seventeen. Gilmore worked in the public school system well into the 1890s, and began writing poetry as a teacher at Silverton, a mining community. It was while she was there that she developed the socialist views that were to mark her writing throughout her life. By 1890, the young Mary Cameron was living in Sydney and her writing was frequently published in the Bulletin by editor A.G. Stephens. Her fiery verses established her as a radical poet and champion of the oppressed. In 1896, she emigrated to Paraguay as part of an experimental commune. It was there that she met and married William Gilmore. When the socialist commune failed, she and her husband returned to Australia and settled on a farm in Casterton. In 1908, Gilmore became the women’s editor of The Worker, published by Australia’s largest and most influential trade union. For the next 20 years, she wrote about women’s rights, children’s welfare and the rights of the worker, firmly establishing herself as one of the foremost writers of the workers’ movement. Her first volume of poetry was published in 1910, and immediately made her one of Australia’s most popular poets. She left the Bulletin in 1931, moving on to other avenues of writing when her politics became too radical for the Australian Workers’ Union, including a regular column for the Tribune, the Communist party’s newspaper. In 1937, she was accorded an imperial honour and became Dame Mary Gilmore. Her patriotic verse was widely read and quoted during World War Two, and it is one of those poems, No Foe Shall Gather Our Harvest, that is part of the copy protection on the $10 bill. Her works include six volumes of verse and three of prose, and literally hundreds of newspaper columns and other journalistic writings. Gilmore died in 1962 at the age of 97 and was accorded a state funeral.